Paganism. Before Christianity came to Europe, there were several perfectly benign pagan deities who had superficially "Devil-like" characteristics, such as horns or cloven feet, or were associated with goats or serpents. One example is the Celtic God Cernunnos, pictured on the left (this is a modern representation on display in the Museum of Witchcraft in Boscastle, Cornwall). 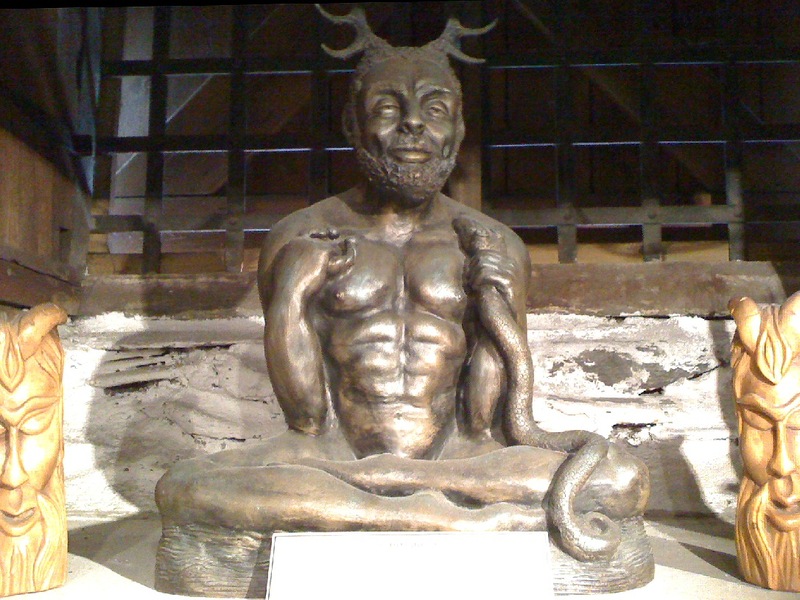 It's possible that worship of such deities survived in secret into the Middle Ages, and when encountered by Christians was misinterpreted as Devil-worship (It's also possible that the iconography of the Christian Devil was deliberately modelled on these pagan deities, in order to deter people from worshipping them). Gnosticism. This was a variant form of Christianity, which existed for several centuries alongside the mainstream form. Gnostics worshipped Christ, who they believed was the Son of the one true God... but at the same time they believed the God described in the Book of Genesis was an impostor who had created a world that was flawed and inherently evil. In this view, the Serpent in the Garden of Eden was arguably on Christ's side, since he was an enemy of the pseudo-God! At least one mediaeval Gnostic sect, the Ophites, actually worshipped the Serpent... although this wasn't really Devil-worship, because in their interpretation the Serpent was the Good Guy and the Creator was the Bad Guy! The Occult. The idea that certain individuals had dealings with the Devil (or one of his subordinate demons) was common in medieval folklore, as attested by the legends of Faust or Pan Twardowski (see A Polish Pact with the Devil). Undoubtedly some people really did try to summon up demons by magical means -- although I wouldn't be surprised if these attempts were inspired by the legends, rather than the other way around. Whether this counts as Devil-worship is a moot point, since the individuals concerned are generally portrayed as being Christians who are revolted by the thought of the Devil -- but persuaded to deal with him by the promise of worldly power. In reality, if such things ever did take place in the Middle Ages, I suspect the participants were just bored, over-educated cynics who had no expectations of anything supernatural occurring... much like the people who enact "Satanic rituals" in our own supposedly more enlightened times!